As of August 2017, two-thirds (67%) of Americans report that they get at least some of their news on social media – with two-in-ten doing so often, according to a new survey from Pew Research Center. This is a modest increase since early 2016, when (during the height of the presidential primaries) 62% of U.S. adults reported getting news from social media. While a small increase overall, this growth is driven by more substantial increases among Americans who are older, less educated, and nonwhite. This study is based on a survey conducted August 8-21, 2017, with 4,971 U.S. adults who are members of Pew Research Center’s nationally representative American Trends Panel. For the first time in the Center’s surveys, more than half (55%) of Americans ages 50 or older report getting news on social media sites. That is 10 percentage points higher than the 45% who said so in 2016. Those under 50, meanwhile, remain more likely than their elders to get news from these sites (78% do, unchanged from 2016). 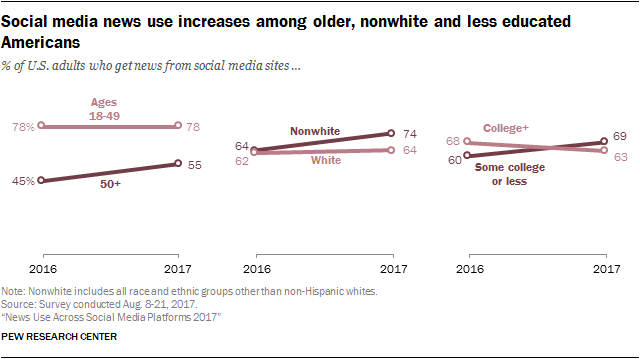 Furthermore, about three-quarters of nonwhites (74%) get news on social media sites, up from 64% in 2016. This growth means that nonwhites1 are now more likely than whites to get news while on social media. And social media news use also increased among those with less than a bachelor’s degree, up nine percentage points from 60% in 2016 to 69% in 2017. Alternatively, among those with at least a college degree, social media news use declined slightly. Because of the vastly different audience sizes across major social media sites, there are two different ways to think about measuring change in news use on these platforms. One is to compare the share of each site’s users that get news on the site, while the second is to measure the total percentage of Americans that report seeing news on the site. 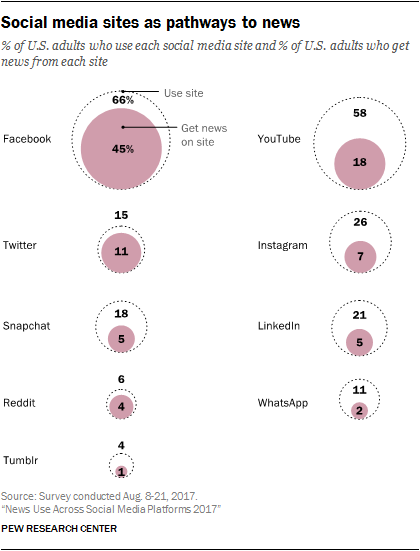 We first look at the share of each site’s users who get news there. Overall, three of the sites measured — Twitter, YouTube and Snapchat — had an increase in the share of their audience that gets news on the site. Since 2013, at least half of Twitter users have reported getting news on the site, but in 2017, with a president who frequently makes announcements on the platform, that share has increased to about three-quarters (74%), up 15 percentage points from last year. On YouTube, about a third of users now get news there (32%), up from 21% in 2016. And news use among Snapchat’s user base increased 12 percentage points to 29% in August 2017, up from 17% in early 2016. Growth on these three sites follows investments the companies have made over the last year in developing their news usability. Twitter, in addition to getting nearly daily attention from the president’s posts, spent the year promoting the platform’s potential for news publishers and has announced launches for multiple news streaming partnerships. YouTube launched and expanded YouTube TV, and the site added a “breaking news” summary on its homepage. It also continues to be used for disseminating information to small, dispersed communities. Snapchat won over a number of big news names this year for its group of Discover publishers: CNN, NBC, and The New York Times joined, and the platform plans on continuing to bring in others. For five of the six remaining sites asked about – Facebook, Reddit, Instagram, LinkedIn and Tumblr –users were about as likely to get news from each as they were last year. The last site, WhatsApp, was asked about for the first time this year, and nearly a quarter, 23%, of its users get news there. Even though YouTube has a large user base – 58% of the population – a smaller portion gets news there. In 2017, both the user base and the share getting news on YouTube grew. The result: 18% of all Americans now get news on YouTube, making it the second most common social media site for news – albeit still far behind Facebook. Twitter has the reverse structure from YouTube: While a large share of its users get news on the site (74% say they do), its audience is significantly smaller overall. This means that overall, fewer Americans get news on Twitter (11% of U.S. adults). Not only have Americans grown somewhat in their use of social media for news overall, but now they are more likely than ever to get news from multiple social media sites. About one quarter of all U.S. adults (26%) get news from two or more of these sites, up from 18% in 2016 and 15% in 2013. News users of Instagram, Snapchat and WhatsApp are particularly likely to get news on multiple social networks; at least 90% of their news users get news on at least two social media sites. There are also some interesting differences in where the overlaps occur – in other words, which sites tend to share users. Instagram’s news users, for example, are much more likely to also get news on Snapchat (40% do so) than are LinkedIn’s news users (8% of LinkedIn news users also get news on Snapchat), for example. But Facebook, with such a large news user base, overlaps with just about every other social media site: About half or more of news users (at least 48%) of each of the other sites studied also get news on Facebook. There are some key differences in the demographic makeup of each site’s news users. Instagram and Snapchat news consumers are considerably more likely to be nonwhite and younger. Twitter and LinkedIn have the largest share of college graduates among their news users – 59% of LinkedIn’s news users have college degrees, as do 45% of Twitter’s news users. 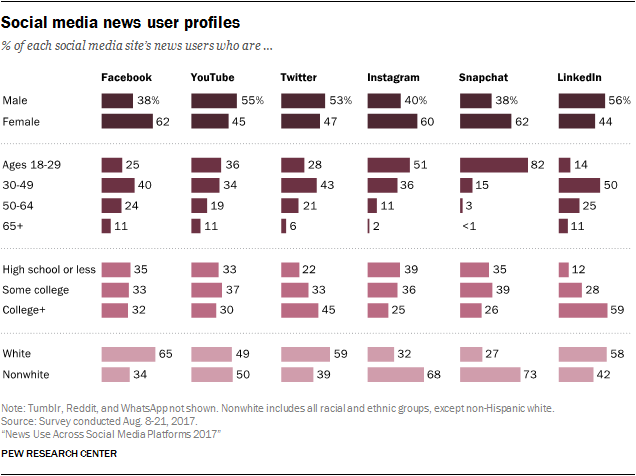 The news user bases of the two largest sites – Facebook and YouTube – include more older Americans than those of smaller sites such as Instagram and Snapchat. Snapchat has by far the youngest group of news users – 82% are ages 18-29. While Facebook and YouTube are still the most popular among this age group for news overall, the makeup of the app’s news audience means that about one-in-five (21%) 18- to 29-year-olds now get news on Snapchat. Getting news on social media doesn’t mean that other more traditional pathways to news are ignored. Many social media news users also get news from a variety of other platforms, although there are some differences among the users of the various sites. 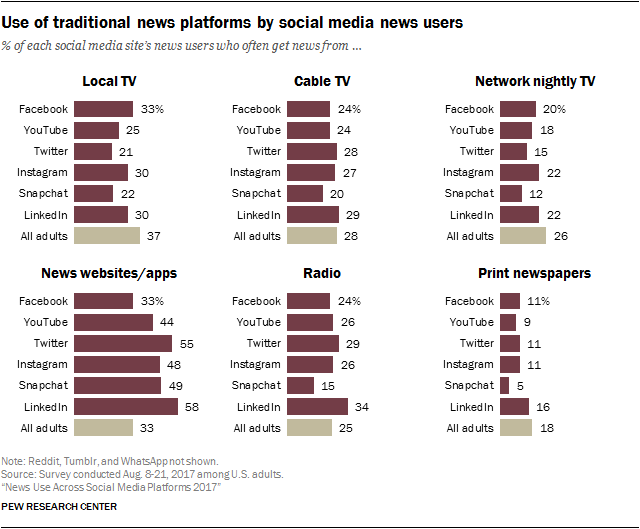 Twitter news users, for example, are more likely to also often get news via news websites and apps than Facebook or YouTube news users. Facebook news users are more likely to often get news from local TV than those on YouTube, Twitter and Snapchat.